This London Blue Topaz and Diamond Cocktail Ring in 14K White Gold puts a unique and glamorous gemstone on display and accents it with over a third carat of colorless sparkle. A total of 34 diamonds accent the stunning indigo gemstone that stars in this ring, creating eye-catching contrast, and rendering this ring a piece that you'll turn to whenever you're looking for an accent that's both classy and bold. 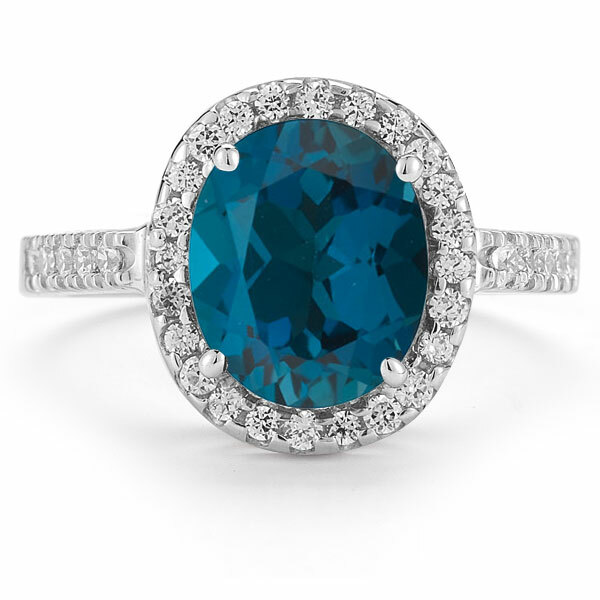 Proudly showcasing the deepest, richest shade of blue topaz, this statement ring is instantly elegant. 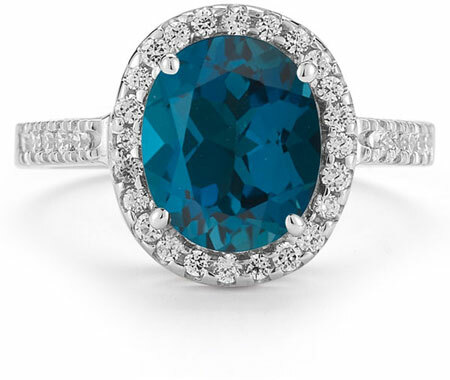 The oval-shaped London blue topaz that serves as the centerpiece of this daring ring has a rich indigo hue that's slightly lighter than that of a sapphire and that's never gray or steely. Measuring a full centimeter high and eight millimeters wide, this stone makes a statement that's far from shy and strikingly sophisticated. Surrounding this London blue topaz are two dozen small round diamonds that form a frame of sparkle. Five additional diamonds accent it on either side, giving this ring extra glimmer and allowing it to reflect light in many directions. The slender band that holds these stones is crafted from gleaming 14K white gold, giving this cocktail ring a cool, shining foundation. We guarantee our London Blue Topaz and Diamond Cocktail Ring in 14K White Gold to be high quality, authentic jewelry, as described above.